Today I am chatting about my favourite skincare products that I have been using this Summer. First up I love a good facial exfoliator, especially in Summer when you find that your skin is dry or dehydrated. 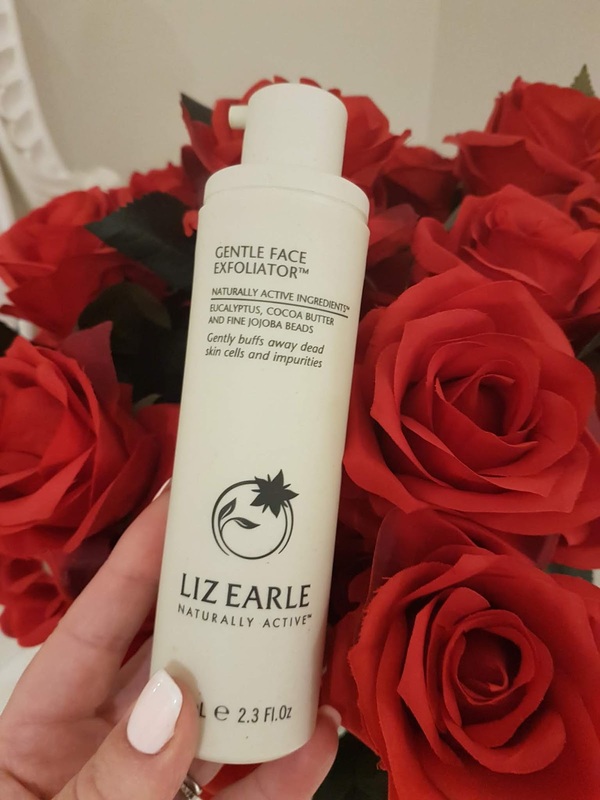 I use so many different products but one of my favourites is Liz Earle Gentle Face Exfoliator. I love Liz Earle skincare & this one is just fab - you just apply all over your face & gently massage in circular motions & then rinse away with warm water. This leaves your skin feeling so soft, refreshed & hydrated. All the Liz Earle skincare range smells so beautiful - you feel like you are having a spa facial at home! Liz Earle products are a little more pricey but definitely worth it! You can pick this one up in Boots for Eur21.50 They do often have this product in the brand duo sets, so watch out for those as you will get to try two of their products for a little less! As for cleansers, I have tried & tested so many & I do like a lot of different products, so I am not what you would call 'brand loyal' to any product in particular. 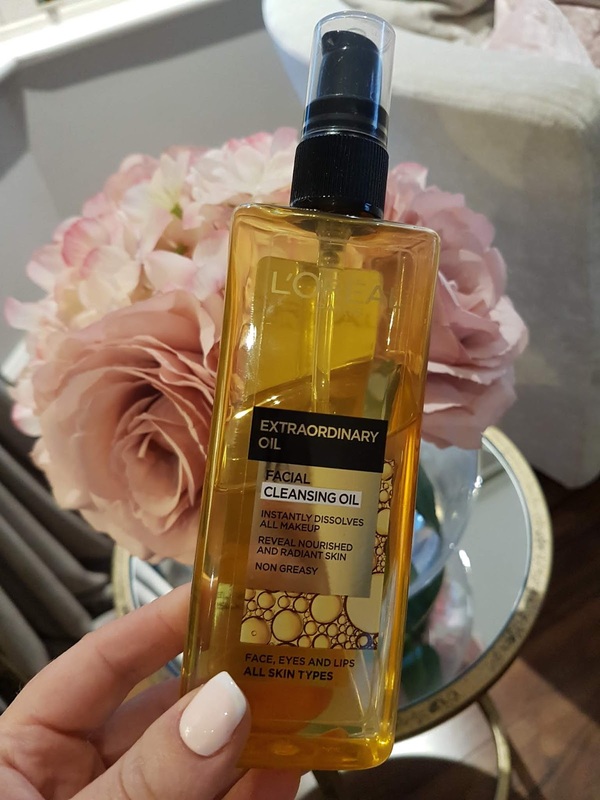 Right now I am literally obsessed with the L'Oreal Facial Cleansing Oil. I would have thought cleansing oils would leave your skin greasy & tacky but this one really doesn't do that! It is such an amazing product - you only need a pump or two of product on each use & apply all over the face & neck, then use a muslin cloth with hot water to remove all of your make up! It literally melts your make up (mascara & all!!) with one wipe of the dampened muslin cloth. However as this cleansing oil is so quick & easy it has become my go to cleanser for the last 4/6 weeks! Every evening it takes me two mins & all of my make up is completely gone. It's magical - cannot recommend this one enough! The best part is that it leaves your skin feeling so soft & beautiful. It is such a clean fresh feeling - exactly what you want from a cleanser. This one costs approx. Eur16 - its not the cheapest cleanser but genuinely this has been my longest lasting cleanser ever - simply because you need so little of the product! I have only used 1/4 of the bottle & I am heavy handed with all of my products! I actually picked this up reduced for under Eur10 in Ryan's Pharmacy in Edenderry - so keep an eye out in the sales in pharmacies for this one! It is def. worth a try - I'm in love anyway!! 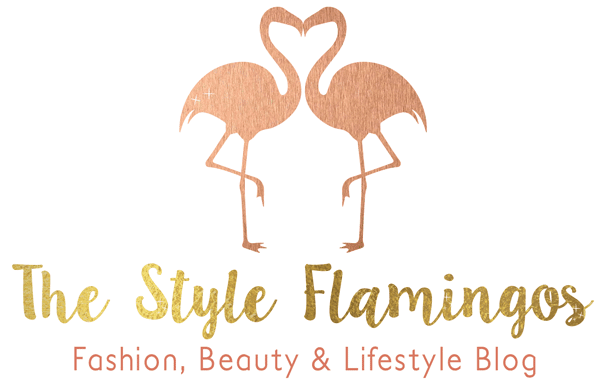 Check out my Skincare highlights on instagram @thestyleflamingos to see me using it! Another cleanser I use a lot when I want to just use a creamy cleanser that takes make up off while chilling on the couch (multi - tasking at its best!) 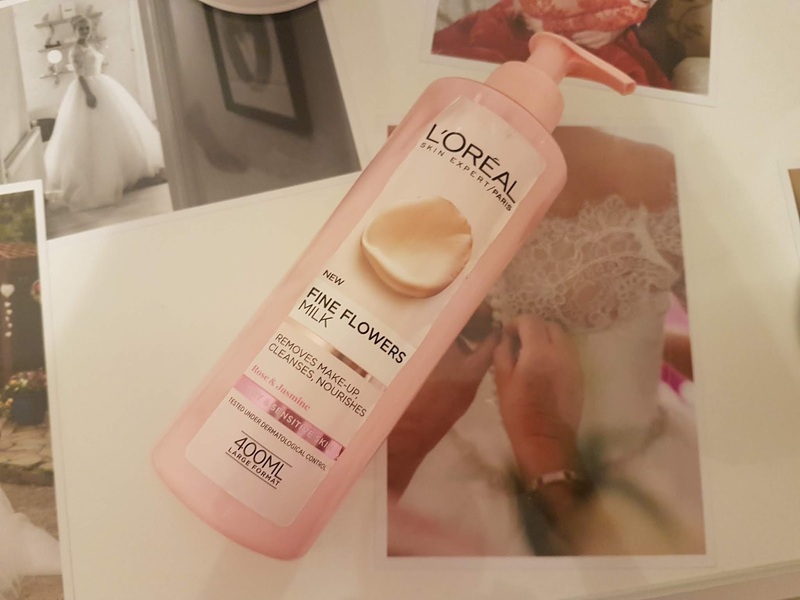 is the L'Oreal Fine Milk in Rose & Jasmine. The one I use is for dry & sensitive skin so this one really nourishes your face! It's so creamy & moisturising but the only thing is I do use a lot of product. I am still a big fan of this one & it is really handy when travelling or going away! Another bargain product as this one is approx. Euro 7. I always have a bottle of this in my skincare drawer. Following a cleanse its nice to use a toner to close in the pores. 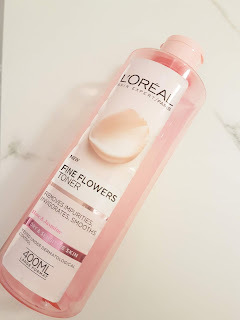 One I reach for at the moment is the L'Oreal Fine Flowers toner. This one is the match of the Fine Milk cleanser! It lasts soooo long too as you really use so little on each application. It's a lovely soft toner that does not leave your skin feeling dry & tight like some toners do! I really like this one & again it's a great price at approx. Euro 7 - so def. worth giving it a go. You can get L'Oreal products in most pharmacies & in Boots! Now for the moisturiser I been yapping on about over on my snaps & insta! This really is a bargain moisturiser and when I say bargain, I mean 'BARGAIN'! at only Eur2.99 from Aldi! I know that some people are very particular about their skincare & might feel better if they pay expensive for skincare & of course that's ok too! I normally buy skincare that's a chemist brand or at most a mid - tier price range luxury product - it really is a personal choice though! A couple of months ago I needed a new moisturiser & I just saw the Lacura brand products in my local Aldi store so I said I would just give it a go! 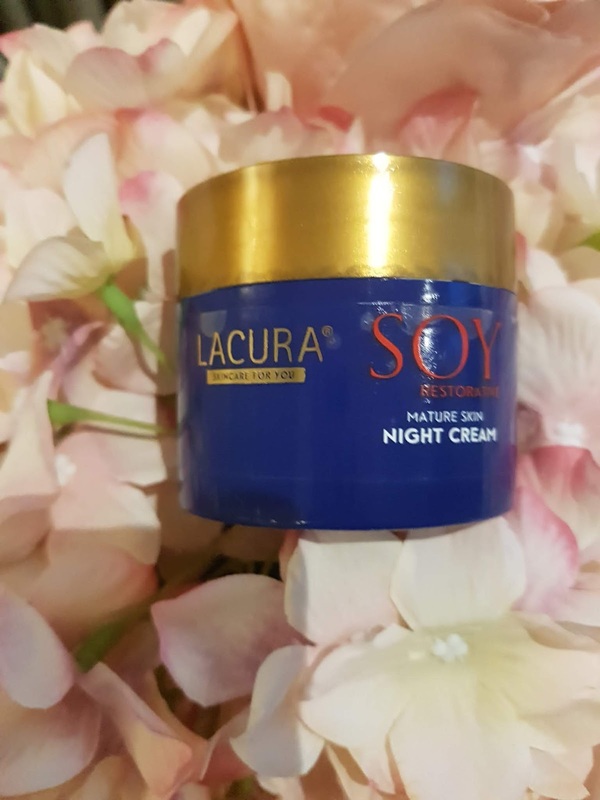 The one I picked up was Lacura Soy Restorative night cream & only realised when I got home that the box says its for 'mature skin' with a recommended age group of 45-60+! Now I am not quite there just yet LOL!! but I said I would give it a go so I am using it ever since & absolutely loving it! 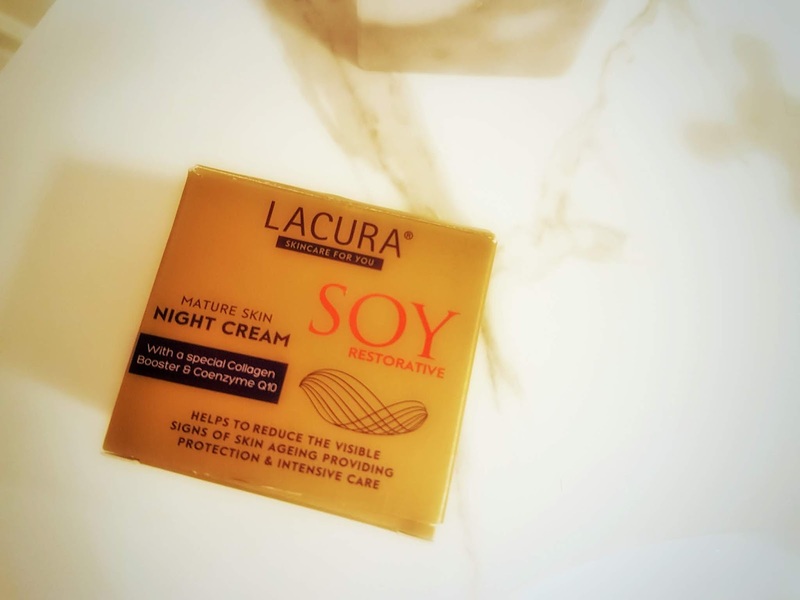 Now there is a wide range of these Lacura products & there is one that is labelled anti - wrinkle cream and it is for an age range of 30 - 50 so I might try this one too. Anyway about the one I picked up - this is a night cream with a special collagen booster! Anything that gives a collagen boost is my friend! I need this kind of boost & this product feels thick, luxurious and beautiful on your skin. I actually look forward to taking my make up off or cleansing my skin & applying this night time cream. You can just feel it sinking into the skin & it feels like its really working! I honestly feel my skin the next day looks different - somewhat better! It is def. plumping my skin & I have only been using this for the past two weeks. The box states that when used regularly this product optimizes the skin's structure, improves skin elasticity & helps to reduce fine lines. It honestly sounds like magic cream doesn't it? It contains a high quality anti - ageing complex which promotes the regeneration of skin during the night. It also contains Hyaluronic Acid which helps to support skins moisture. It really is a fabulous product & for the price I honestly can't believe it! There are other day time creams & multi intensive serums available in the range too so I will definitely be picking these up & I will keep you posted on these items too. 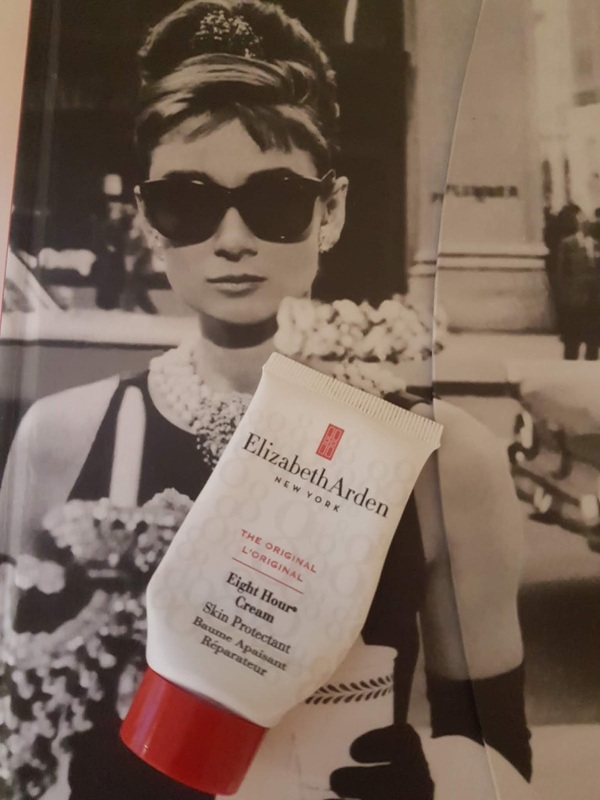 So finally before bed I like to apply a lip balm & at the moment I am using Elizabeth Arden 8 hour cream - now you can use this cream for many purposes but I love it on my lips - it feels amazing & it really helps with dry lips. I would suffer from dry lips a lot especially wearing many matte lipsticks & this has really saved me this Summer. As you will see from the pic I use this a lot & I will definitely re purchase as I am a big fan. So that's my evening skin care routine at the moment & I have been using all of these products this Summer & I am in love - I will def. repurchase all of them when I run out! I think whatever products you choose to use, make sure they suit your skin type & just use the products consistently so that you will see results. I think you def. need to use things for a number of weeks before you will see any difference in your skin. 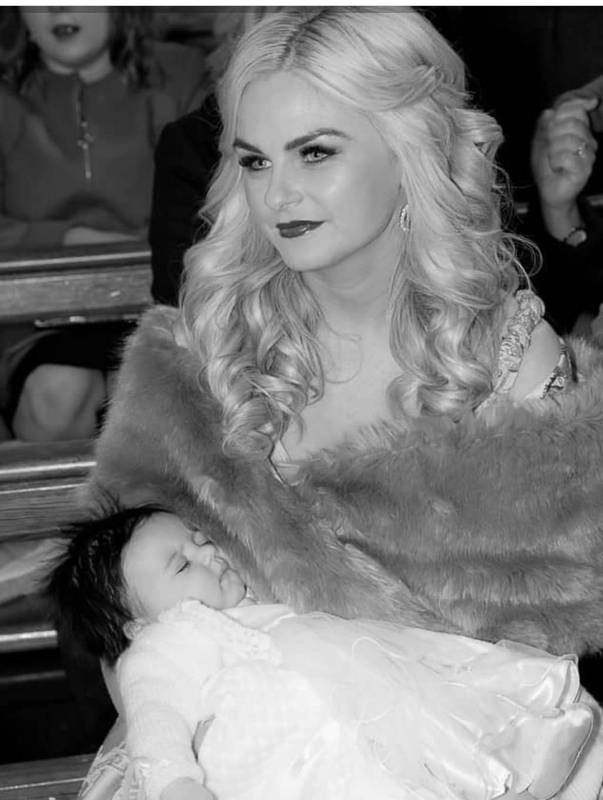 To be honest I try my best with my skincare but of course there will be nights when I hit the pillow with my make up on which is so not good for my skin but I try to keep these nights to a minimum (it has to be said those nights might just include wine!!) I try to be good usually LOL!! Anyway, I hope you find tonight's post useful & do let me know if you pick up any of the recommended products or if you have been using any of these already! I would love to know how you get on with them!